This tutorial was written by Jenny on 9-24-2009. Resemblance to any other tutorial is purely coincidental and unintentional. I am using the artwork of Chrissy Clark. You need a license to use her artwork. I have a license through Artistic Minds Inc.
Open template, hide credit layer and wordart layer, shift d to duplicate, close original. Select Raster8 with magic wand, copy & paste Halloween 15 as a new layer, selections,invert,delete, select none, hide original layer. Select Raster2 with magic wand, copy & paste Halloween 10 as a new layer, selections, invert,delete,select none, hide original layer. Select Copy of Raster2 with magic wand, copy & paste Halloween12 as a new layer, selections, invert, delete, select none, hide original layer. Select Raster3 with magic wand, copy & paste Halloween 1 as a new layer, selections, invert, delete, select none, hide original layer. Select Raster7 with magic wand, copy & paste Halloween 6 as a new layer, selections, invert, delete, select none, hide original layer. Select Raster4 with magic wand, copy & paste Halloween 19 as a new layer, selections, invert, delete, select none, hide original layer. Copy & Paste doodle2 as a new layer, resize 65%, move to the top right above the candy corn paper, add drop shadow. Copy & Paste doodle1 as a new layer, resize 65%, flip, add drop shadow, move to the bottom left above the candy corn paper. Copy & Paste frame3 as a new layer, place in the center, resize 75%, add drop shadow. Copy & Paste Halloween 16 as a new layer, move below frame, resize 75%, use the selection tool to draw around the frame, selections, invert, delete on paper layer, select none. Copy & Paste ghost as a new layer, add drop shadow, place at the top left of the canvas. Copy & Paste black cat as a new layer, resize 65%, add drop shadow, place bottom right of the canvas. Copy & Paste pumpkinduo as a new layer, resize 50%, add drop shadow, place at the bottom left corner. Copy & Paste tube as a new layer, resize if needed, add drop shadow, place above frame layer. Copy & Paste tree1 as a new layer, place below the tube and to the right, add drop shadow. This tutorial was written by Jenny on 9-24-2009. Resemblance to any other tutorial is purely coincidental and unintentional. I am using the artwork of Ismael Rac. You need a license to use his artwork. I am licensed through Artistic Minds Inc. Copy & Paste frame6 as a new layer, image, free rotate, 90 degrees right, resize 80%, add drop shadow. Copy & Paste paper10 as a new layer, resize 65%, move below frame, use the selection tool to remove any excess. Copy & Paste satin bow2 as a new layer, resize 50%, add drop shadow, place on the frame top left corner. Copy & Paste hearttag as a new layer, resize 75%, add drop shadow, move down just a bit. Copy & Paste tube, resize if needed, add drop shadow, place between the frame layer and the hearttag. Copy & Paste ribbonpuddle2 as a new layer, resize 75%, free rotate 30 degrees right, add drop shadow. Copy & Paste beadcharm1 as a new layer, resize 65%, see my tag for placement, add drop shadow. Copy & Paste flower2 as a new layer, resize to your liking, add drop shadow, place on the frame bottom right. Copy & Paste blossoming2 as a new layer, resize 65%, add drop shadow, place below tube and to the right, duplicate,mirror, duplicate, free rotate 15 degrees right, duplicate,mirror, arrange to your liking. Copy & Paste doodle1 as a new layer, move below frame and paper, move over to the left just a bit, use the selection tool to remove the part that is sticking out on the right, add drop shadow. Copy & Paste doodle3 as a new layer, move below the previous layer, mirror, flip, place to the right, remove any excess on the left with selection tool, add drop shadow. Copy & Paste flower8 as a new layer, resize 65%, add drop shadow, effects, plugins, MuRa's Meister Copies, encircle with default settings, resize 65%, move to the bottom left corner below frame, duplicate,mirror, flip. Copy & Paste gem1 as a new layer, resize 65%, add drop shadow, effects, plugins, MuRa's Meister Copies, encircle with default settings, resize 65%, move to the top right corner below frame, duplicate,mirror, flip. Copy & Paste flower5 as a new layer, add drop shadow, resize 65%, effects, plugins, MuRa's Meister Copies, encircle with default settings, move below all other layers, place above mask layer. Merge visible. Resize canvas if you'd like. Add copyright info and text and you are done. I'd love to see your results. Feel free to email me. If you like my tutorials please leave some luv in my CBox. It's greatly appreciated. 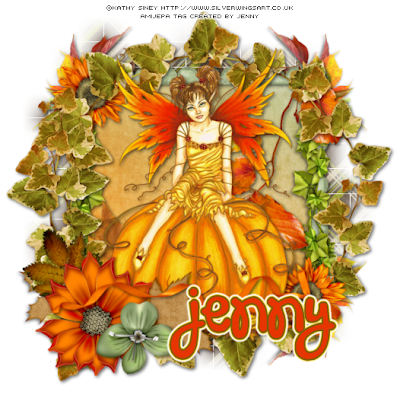 This tutorial was written by Jenny on 9-22-2009. Resemblance to any other tutorial is purely coincidental. I am using the artwork of Kathy Siney. You need a license to use her artwork. I am licensed through Artistic Minds Inc.
Open new canvas 600 x 600. Flood fill white. New raster layer, select with magic wand, copy & paste paper11 into selection, select none, apply mask. Copy & Paste element52 (light green frame) as a new layer, resize 70%. Copy & Paste paper23 as a new layer, move below frame, resize 50%, then add drop shadow to the frame. Copy & Paste tube, keeping it above all other layers, resize if needed, add drop shadow. Copy & Paste element23 (bunch of leaves) as a new layer, resize 50%, add drop shadow, place at the top left corner below the frame, duplicate, mirror, duplicate,flip, duplicate,mirror. Copy & Paste element11 as a new layer, resize 65%, place below tube layer. Copy & Paste element23 as a new layer, resize 50%, place on the frame in the top left corner, add drop shadow, duplicate, mirror, flip. Copy & Paste element31 as a new layer, resize 50%, add drop shadow, place below the sunflower layer on the left, duplicate, mirror. Copy & Paste element32 as a new layer, resize 70%, add drop shadow, place to the left. Copy & Paste element33 as a new layer, resize 70%, add drop shadow, place next to element32. Copy & Paste element4 as a new layer, resize 70%, add drop shadow, place below the other 2 flower layers, duplicate, mirror and move over to the left some more. Copy & Paste element65 as a new layer, resize 50%, add drop shadow, mirror, see my tag for placement. Copy & Paste element41 as a new layer, add drop shadow, place below tube layer. Copy & Paste element45 as a new layer, resize 80%, add drop shadow, place toward the bottom. Resize canvas or crop it down to your liking. Add copyright info and text and you are done. 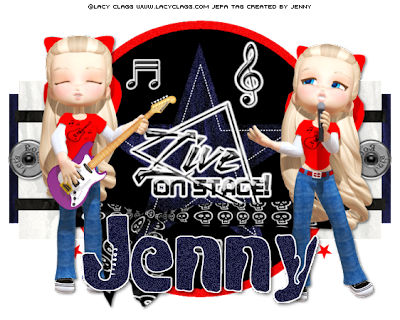 This tutorial was written by Jenny on 9-22-2009. Resemblance to any other tutorial is purely coincidental and unintentional. I am using the artwork of Lacy Clagg. You need a license to use her artwork. I am licensed to this image through LCTS. Select Raster1 with magic wand, copy & paste paper18 as a new layer, resize 75%, selections,invert,delete, select none, hide original layer. Select Raster3 with magic wand, copy & paste paper15 as a new layer, resize 75%, selections, invert, delete, select none, hide original layer. Select Raster2 with magic wand, copy & paste paper14 as a new layer, resize 75%, selections,invert, delete, select none, hide original layer. Now on the 3 small circle layers, click each one with magic wand, copy & paste paper16 as a new layer, resize 65%, selections,invert,delete,select none, hide original layer. Select Raster6 with magic wand, copy & paste paper14 as a new layer, resize 65%, selections,invert,delete, select none, hide original. Copy & Paste SpookyTree1 as a new layer, resize to your liking, move over to the right. 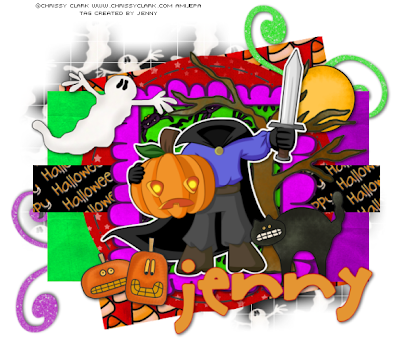 Copy & Paste Happy Haunting Wordart as a new layer, resize 55%, add drop shadow, place to the left of the canvas. Copy & Paste fence as a new layer, resize to your liking, place toward the bottom left of the canvas. Copy & Paste tube as a new layer, placing it toward the right, resize if needed, add drop shadow. Copy & Paste any other elements you'd like to add. I won another Gorjuss Award! Woohooo! The tag I made below was the winner in this past weeks Frame Challenge at the Just Gorjuss Forum. The Frame was made by Lorna. I love her frames!!! This tutorial was written by Jenny on 9-19-2009. Resemblance to any other tutorial is purely coincidental and unintentional. I am using the artwork of Mattt Poser. You need a license to use his artwork. I am licensed to his artwork at Artistic Minds Inc.
Open Template, hide credit layer, shift d to duplicate, close the original. Select Raster5 with magic wand, copy & paste paper10 as a new layer, selections, invert, delete, select none, hide original. Select Raster2 with magic wand, copy & paste paper7 as a new layer, resize 75%, selections, invert,delete, select none, add drop shadow, hide original. Select Raster3 with magic wand, copy & paste paper8 as a new layer, resize 75%, selections,invert,delete,select none, add drop shadow, hide original. Select copy of raster3 with magic wand, copy & paste paper3 as a new layer, resize 75%, selections, invert,delete, select none, add drop shadow, hide original. Select Copy 2 of Raster 3 with magic wand, copy & paste paper9 as a new layer, resize 75%, selections,invert,delete,select none, add drop shadow, hide original. Select Raster4 with magic wand, copy & paste paper2 as a new layer, selections, invert, delete, select none, hide original. Copy & Paste frame5 as a new layer, resize 50%, place above the circle layer, add drop shadow. Copy & Paste diamond rain as a new layer, move below the frame layer. Copy & Paste tube, resize if needed, if you'd like to have it sticking out of the frame like mine then use the selection tool to select that part, right click, promote selection to layer, move to the top, select none. Copy & Paste wrap2 as a new layer, resize 75%, add drop shadow. Copy & Paste cloud as a new layer, duplicate,mirror, see my tag for placement of both. Copy & Paste Corsage as a new layer, resize 50%, add drop shadow, place to the bottom right, duplicate,mirror, flip. Copy & Paste label as a new layer, resize if you'd like, add drop shadow and place to your liking. Copy & Paste feather flower1 as a new layer, resize 65%, add drop shadow, see my tag for placement. Copy & Paste feather flower as a new layer, resize 65%, add drop shadow, mirror, see my tag for placement. If you like my tuts please leave a little luv in my CBox! Costumes And Spiderwebs, Oh My! This tutorial was written by Jenny on 9-19-2009. Resemblance to any other tutorial is purely coincidental and unintentional. I am using the artwork of Emma Salamanca. You need a license to use her artwork. I am licensed through Artistic Minds Inc.
On Raster 5 (spiderweb), select all, float, defloat, copy & paste paper09 as a new layer, selections, invert, delete, select none, hide original layer. Select Raster2 with magic wand, copy & paste paper14 as a new layer, resize 75%, selections,invert,delete, select none, hide original layer. Select Copy of Raster2 layer with magic wand, copy & paste paper07 as a new layer, resize 75%, selections, invert, delete,select none, hide original layer. Select Raster4 and Copy 2 of Raster 4 with magic wand, copy & paste paper13 as a new layer, resize 75%, selections,invert,delete,select none, hide original layer. Select Copy of Raster4 and Copy 3 of Raster4 with magic wand, copy & paste paper08 as a new layer, selections,invert,delete, select none, hide original layer. Copy & Paste tube as a new layer, resize if needed, add drop shadow. Copy & Paste element10 (purple doodle) as a new layer, resize 75%, place to the left under your tube, add drop shadow. Copy & Paste element12 (orange doodle) as a new layer, resize 75%, flip, place to the right under your tube, add drop shadow. Copy & Paste element15 as a new layer, resize 50% twice then again 75%, add drop shadow, see my tag for placement. Copy & Paste element17 as a new layer, resize 50% twice, add drop shadow, see my tag for placement. Hide the tube layer and Raster1 layer, merge all other layers visible, resize by 85%, unhide the tube and raster layer. On Raster1 flood fill with white, new raster layer, select with magic wand, copy & paste paper07 into selection, select none, apply mask, resize 85%. Now you can crop or resize your canvas if needed. Also would appreciate you leaving some luv in my CBox. This tutorial was written by Jenny on 9-9-2009. Resemblance to any other tutorial is purely coincidental. 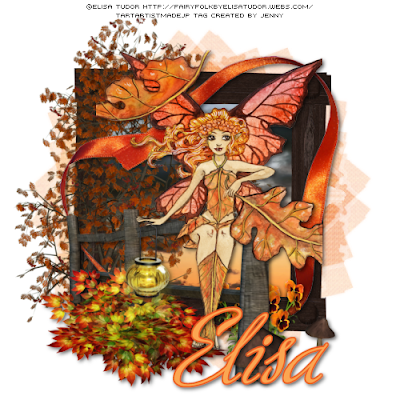 I am using the artwork of Elisa Tudor. You need a license to use her artwork. I have a license through MyTagArt. Open a new canvas 500 x 500 flood fill white. New raster layer, select with magic wand, copy & paste bkg12 into selection, select none, apply mask. Copy & Paste frame2 as a new layer, resize 55%, add drop shadow. Copy & Paste bkg16 as a new layer, place below frame, resize 50% then again 65%. Copy & Paste fence as a new layer, resize to your liking, this will depend on the tube you are using also, place above frame, add drop shadow. Copy & Paste tube, resize if needed, add drop shadow, place on fence. Copy & Paste leaves as a new layer, resize 50% then again 65%, add drop shadow, place along bottom of fence. Copy & Paste mushrooms as a new layer, resize 50% then again 65%, add drop shadow, place to the right of the fence, use the eraser tool to remove the one to the far right. Copy & Paste tree 1 as a new layer, resize 75%, place below fence layer, see my tag for placement. Copy & Paste heart ribbon as a new layer, place below fence layer. Copy & Paste flowers of choice as a new layer, resize 65% then 50%, place below the fence layer and toward the bottom of the largest post (see my tag), add drop shadow, duplicate,mirror and place together. Copy & Paste lamp, resize 50% twice then again 65%, place so that it looks like your tube is holding it, add drop shadow. Add copyright info and your text and you are done. This tutorial was written by Jenny on 9-6-2009. Resemblance to any other tutorial is purely coincidental and unintentional. I am using the artwork of Susan McKivergan. You need a license to use this artwork. I am licensed through Artistic Minds Inc.
You can purchase this kit at Artistic Minds Inc.
Open a new canvas 500 x 500 and flood fill white. Copy & Paste frame 1 as a new layer, resize 65%, add drop shadow. Copy & Paste each of the 3 images as a new layer, resize to your liking, place below each of the framed areas, use the selection tool to draw around the frame, selections,invert,delete on each image layer, select none. Copy & Paste Petunias as a new layer, resize 50%, add drop shadow, move below framed images, duplicate, mirror. Copy & Paste ring as a new layer, resie 50% then again 65%, see my tag for placement, add drop shadow. Copy & Paste heart as a new layer, resize to your liking, add drop shadow, place below ring. Copy & Paste blingstring as a new layer, move below framed images but above the petunias, add drop shadow. Copy & Paste sequence as a new layer, resize 50% then again 70%, add drop shadow, place above blingstring layer. Copy & Paste roses as a new layer, resize 50%, flip, add drop shadow, duplicate, mirror, flip. Copy & Paste bird as a new layer, resize 50% then again 65%, add drop shadow, place above frame. Copy & Paste brad3 as a new layer, resize to your liking, place on the right bottom of the frame, duplicate, move to the top left of the frame. This tutorial was written by Jenny on 9-6-2009. Resemblance to any other tutorial is purely coincidental and unintentional. I am using the artwork of Lindsay Cheesewright. You need a license to use her artwork. I have a license through MyTagArt. Open new canvas 500 x 500 and flood fill white. New raster layer, select with magic wand, copy & paste Pretty4 into selection, select none, apply mask. Copy & Paste Pretty38 (Pink Frame) as a new layer, resize 50% then again 65%, add drop shadow, move upward just a bit. Copy & Paste tube as a new layer, move toward the bottom a bit, add drop shadow. Copy & Paste Pretty36 as a new layer, resize 50% then again 65%, add drop shadow, move below tube and place on the right of the frame, duplicate, mirror. Copy & Paste Pretty24 as a new layer, resize 50% twice, add drop shadow, place on the left side of the frame. Copy & Paste Pretty1 as a new layer, see my tag for placement, resize 50% twice then again 75%, add drop shadow, duplicate, mirror. Copy & Paste Pretty4 as a new layer, see my tag for placement, resize 50% twice then again 65%, add drop shadow, duplicate, mirror. Copy & Paste Pretty5 as a new layer, resize 50% twice then again 65%, add drop shadow, see my tag for placement. Copy & Paste Pretty35 as a new layer, resize 50% twice, add drop shadow, move below the blue rose layer, duplicate,mirror. Copy & Paste Pretty22 as a new layer, resize to your liking, see my tag for placement. Copy & Paste Pretty16 as a new layer, resize to your liking, place below the heart, add drop shadow. This tutorial was written by Jenny on 9-5-2009. Resemblance to any other tutorial is purely coincidental and unintentional. I am using the artwork of Lacy Clagg. You need a license to use her artwork. I am licensed to this image through LCTS. Open template, hide credit layer and word art, shift d to duplicate and close original. On each of the background frames and frames, image, flip. Select rectangle1 with magic wand, copy & paste Paper3 as a new layer, resize 65%, selections,invert,delete,select none, hide original. Select square with magic wand, copy & paste Paper6 as a new layer, resize 65%, selections,invert,delete,select none, hide original. Select rectangle2 with magic wand, copy & paste Paper4 as a new layer, resize 65%, selections,invert,delete,select none,hide original layer. Select rectangle3 with magic wand, copy & paste Paper2 as a new layer, resize 65%, selections,invert,delete,select none, hide original. Select each of the background layers with magic wand, copy & paste Paper8 as a new layer, resize 65%, selections,invert,delete,select none, hide original. Be sure to drag the new background frame layer below the frame layers. Copy & Paste fence2, resize 50% twice, add drop shadow, see my tag for placement, duplicate, mirror. Copy & Paste flowers and vine as a new layer, resize each to your liking, add drop shadow, place in the middle of the fence. Copy & Paste 2 of the caterpillars as a new layer, resize 50%, add drop shadow and see my tag for placement. Copy & Paste each of the 3 tubes you'd like to put in the frames, place each below each of the frames, select inside each of the frames with magic wand, modify, expand 2, selections, invert, click delete on each tube layer, select none, add a drop shadow to each. Copy & Paste the 4th tube as a new layer, resize to your liking, add drop shadow, place infront of the flowers. Crop or resize the canvas if you'd like. Add copyright info and text and you are done. Open template, hide text and credits, shift d to duplicate, close original. Select pink rectangle 1 & 2 with magic wand, copy & paste Paper11 as a new layer, resize 75%, selections,invert,delete, select none, hide original layers. Select black thin rectangle with magic wand, copy & paste Paper2 as a new layer, selections, invert, delete, hide original layer. Select the black circle layer with magic wand, copy & paste Paper3 as a new layer, selections,invert,delete,select none, hide original. Select white circle with magic wand, copy & paste Paper6 as a new layer, resize 65%, selections,invert,delete,select none, hide original. Select pink large rectangle with magic wand, copy & paste Paper5 as a new layer, resize 75%, selections,invert,delete, select none, hide original. Select black large rectangle with magic wand, copy & paste Paper1 as a new layer, selections,invert,delete,select none, hide original layer. Select both small pink rectangles with magic wand, copy & paste Paper12 as a new layer, selections,invert,delete, select none, hide original. Copy & Paste Journal Tag4 as a new layer, resize 65%, see my tag for placement, add a subtle drop shadow. Copy & Paste flower1 as a new layer, add drop shadow, resize 65%, place at the top left of the canvas. Copy & Paste Pumpkins2 as a new layer, resize 65%, add a subtle drop shadow, place at the bottom right of the canvas, see my tag. Copy & Paste wordart as a new layer, resize 50%, add drop shadow, see my tag for placement. Copy & Paste scarecrow of choice as a new layer, resize 65% then again 85%, add drop shadow and place to your liking. Open a template, hide all text layers and credit layer, shift d to duplicate, close the original. Select the pink rectangle layer with magic wand, copy & paste Paper6 as a new layer, selections,invert,delete,select none, hide original layer. Select black rectangle with magic wand, copy & paste Paper2 as a new layer, selections,invert,delete,select none, hide original layer. Select white rectangle 1 & 2 with magic wand, copy & paste Paper1 as a new layer, selections,invert,delete, select none, hide original layer. Pink Star-big layer, select with magic wand, copy & paste Paper6 as a new layer, selections,invert,delete, select none, hide original. Select pink circle with magic wand, new raster layer, flood fill with a color that compliments your tubes, select none, hide original, apply dsb flux bright noise 40. On the pink stars layer, select all, float, defloat, new raster layer, flood fill with the same color, select none, hide original. Copy & Paste word art as a new layer, resize to your liking, add gradient glow fat white 5.00, place on the star. Copy & Paste musical notes, placing them to your liking, add the same gradient glow from above, resize to your liking. Copy & Paste the 2 tubes as a new layer, resize if needed, add drop shadow and see my tag for placement. Copy & Paste ribbon of choice, resize 75%, place below tubes, use the eraser tool to remove any excess, add a drop shadow of choice. Copy & Paste buttons, resize and place to your liking. Resize the canvas, I resized mine by 75%, add copyright info and text and you are done. Woohooo the blog for the AMI CT has been announced. 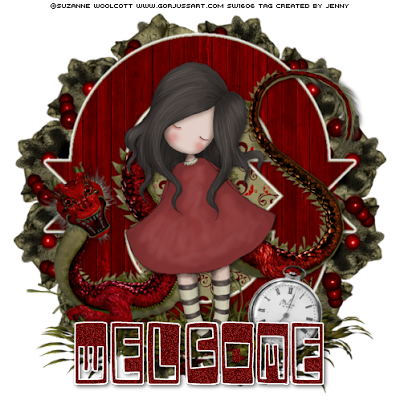 I'm so happy to report that I am a CT Member for the fantastic Artistic Minds Inc. aka AMI. This tutorial was written by Jenny on 9-3-2009. Resemblance to any other tutorial is purely coincidental and unintentional. I am using the artwork of Ismael Rac. You need a license to use his artwork. 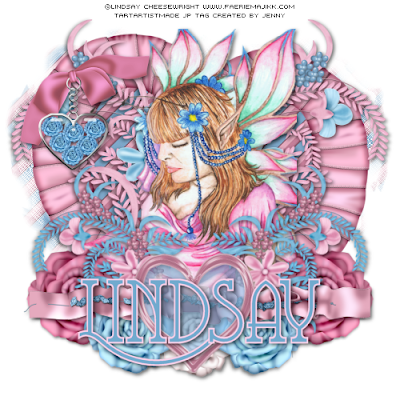 I am licensed through Artistic Minds Inc.
Open template, hide credit layer, image, canvas size 600 x 600. Raster 1 flood fill white, new raster layer, select with magic wand, copy & paste Paper2 into selection, select none, apply mask. Copy & Paste doodle art, move upwards and to the left, duplicate, mirror, flip and over to the right, make sure you add a drop shadow to both. On the slats layer, selections, select all, float, defloat, copy & paste Paper5 as a new layer, selections, invert,delete, select none, hide original layer. Select rectangle 2 & 3 with magic wand, copy & paste Paper1 as a new layer, selections, invert, delete, select none, hide original layers. On the frame layers for both rectangles add a subtle drop shadow. Select rectangle4 with magic wand, copy & paste Paper4 as a new layer, resize 75%, selections,invert,delete, select none, hide original layer, add a drop shadow to the frame. Merge star1 and star2 layers together only, select with magic wand, copy & paste Paper3 as a new layer, selections, invert, delete, select none, hide original, apply gradient glow to the stars, 5.00 fat and match it to the kit or your tube, select the gradient glow on each and apply dsb flux bright noise 24, select none. Copy & Paste black flower as a new layer, resize 65%, add drop shadow, duplicate, see my tag for placement of both. Copy & Paste tube, resize if needed and add drop shadow. You will need to move the rectangle, frame and wordart above the tube layer, we want to hide the tiny words, on the rectangle layer you will need to select with magic wand, new raster and flood fill black, select none, apply dsb flux bright noise. On the You Want Me words, select all, float, defloat, new raster layer, I made a gradient fill and flood filled with that, select none, hide original layer, selections, select all, float, defloat, modify, expand 2, new raster layer, flood fill white, select none, move below words, add drop shadow. Copy & Paste paper heart as a new layer, resize to your liking , add drop shadow, place to the left of the canvas. Copy & Paste paper arrows as a new layer, add drop shadow, place on the rectangle frame as I have mine. Resize canvas if you'd like, add copyright info and text and you are done.